Shelby Dining Table Dynamically different, the Shelby dining table is sure to make a statement. Visibly contrasting black and white colors draw the eyes and cast a dramatic shadow. It still manages to keep a casual air though with its welcoming wood tones. Not only does Shelby look great, this table also offers plenty of functionally with four drawers. Dynamically different, the Shelby dining table is sure to make a statement. Visibly contrasting black and white colors draw the eyes and cast a dramatic shadow. It still manages to keep a casual air though with its welcoming wood tones. Not only does Shelby look great, this table also offers plenty of functionally with four drawers. L: 72" x W: 40" x H: 30.5" Weight: 130 lbs. This set is absolutely beautiful, but I'm not a happy customer. I've only had this set for 2 months and I have to constantly tighten the legs of both the table and chairs. Now I have just noticed the dark coating on the table top is peeling. Hello Naiemah, we're very sorry to hear about this experience and would like to look into this for you. Could you e-mail your order details, contact information and a copy of your concerns to rfcare@raymourflanigan.com so we can better assist? Thank you! It looks lovely and it looks so neat. It seems quite strong. Beautiful table top. Love the charcoal gray top against the distressed white legs. The drawers on each side of the table are great. Only thing is I already noticed the a tiny spot on the table where the paint chipped a bit after the first few days but I will address it with the five year warranty where they will come and fix it. Otherwise Its a great table and I recommend it. FULL EXTENSION DRAWERS? NOT EVEN CLOSE! The good: The workmanship on the Shelby Dining Table is excellent. 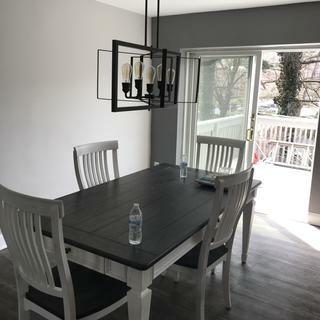 Charcoal tabletop and white base makes for a beautiful, contemporary combination and the white is distressed just slightly, which keeps it from looking beat up. 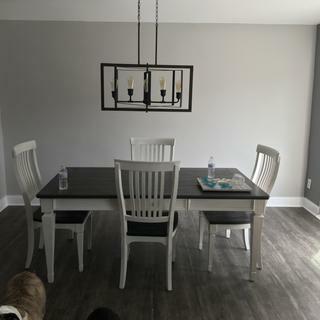 I love the overall look and since it weighs in at 130 lbs, the table is also stable and sturdy - just the right size, too, for my small space. Can I use bleach free Clorox wipes to clean table? BEST ANSWER: Please use the recommended cleaning instructions: Dust with a soft, dry cloth. All spills should be cleaned up immediately.